Kushog Lake is a headwater in the Gull River Watershed that meets the Trent River basin at Balsam Lake south of Coboconk. The other Northern watershed is the Burnt River Watershed that flows from Drag Lake north of the town of Haliburton down through the Kinmount Dam joining the Trent River basin at Cameron Lake. Click here to see a map of the Gull River Watershed in the Trent-Severn Waterway (TSW). Kushog Lake has a capacity of 10.5 feet or 3.2 meters. We have an agreement with TSW that Kushog Lake will only be filled to 95% capacity. 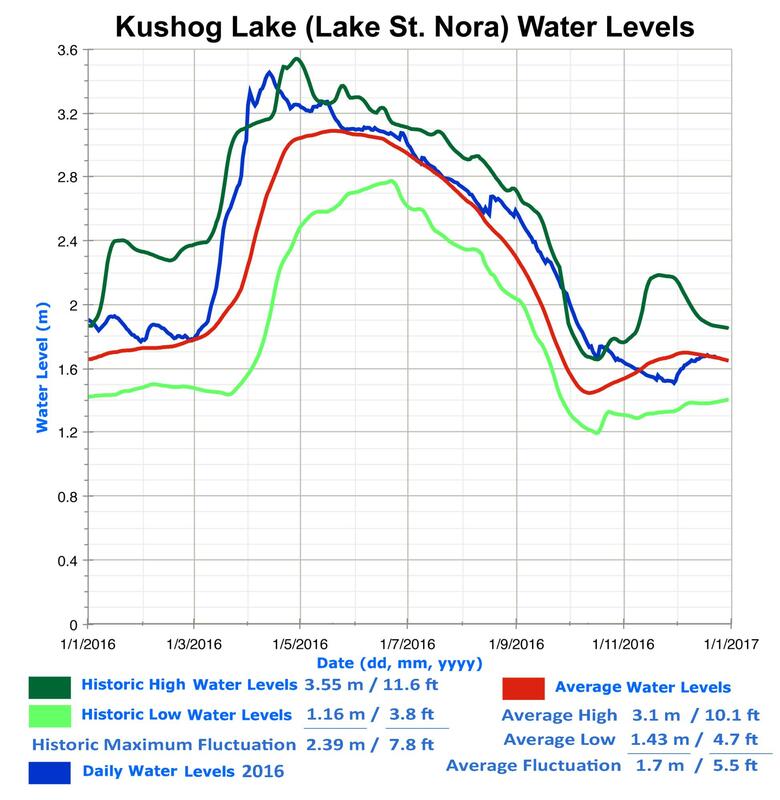 The average water level fluctuation on Kushog Lake to 2016 is 1.67 meters or 5.5 feet. Historically the level has fluctuated as much as 2.39 meters or 7.8 feet. In April 2012 the reached the historic maximum high - the lake overflowed by 15% or 1.5 feet.